Brave, bold, innovative and resourceful - these are just a few words I’d use to describe Toro Rosso. They’re a team that are able to work with far less than their sibling but provide their owners with exactly the bang per buck they’re looking for to power their young driver programme. Their partnership is now in its second year with Honda, as the pair used the STR13 as a mobile development unit for them and the senior Red Bull team who will also join the Honda ranks in 2019. Having switched to the Japanese marquee late in the development cycle for 2018 there was clearly room for improvement, something well hopefully see in the STR14. 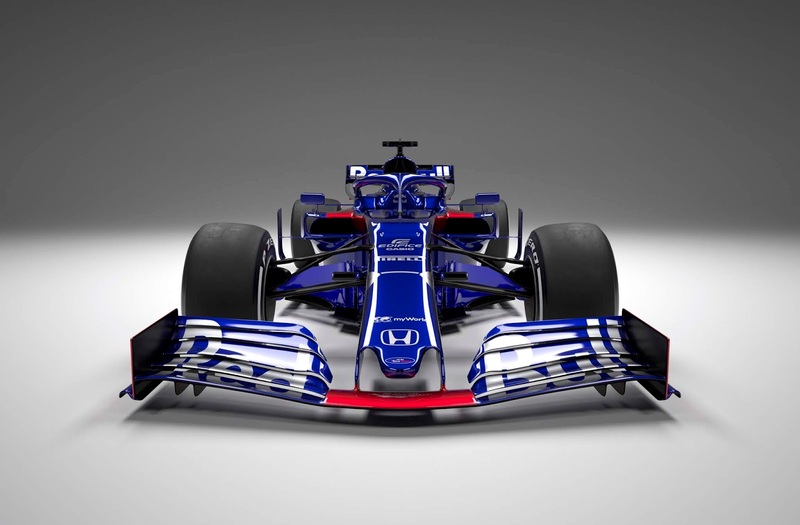 First thing we’ll note about Toro Rosso’s 2019 challenger is the more simplistic front wing that the regulations have driven the teams toward this season. As we know all of the complex outwash devices that sat on top of the wings have been discarded, whilst the surfaces that remain are now much more heavily regulated. The wing features the now default five element wingspan with a continued trend toward the curvature at the inboard end to help control the vortex shed 250mm from the cars centreline. The design shown here is all very conventional in terms of the endplate, footplate and strake design but what is interesting is the upturned leading edge of the mainplane, which clearly shows the strakes and inner footplate more clean flow than if it were not raised. The team have moved away from the raised front suspension wishbone used over the last two seasons, a decision driven by the way in which airflow moves past the suspension to the sidepods behind. The team have also decided to move to the periscope style sidepods first run by Ferrari in 2017 and subsequently copied by a number of teams last year. The design reduces the effect the front tyres wake can have on the cooling outlet and allows for the placement of an array of airflow manipulating devices to be used to improve flow over and around the sidepods. The extended front wing pillars used by the team last season that incorporate numerous slots have been retained, whilst in behind it we find a NACA style inlet (white arrow) that powers the now pronounced outlet on the upper surface. This pronunciation has been made due to the transition bump that’s appeared where the chassis and nose meet. This bump is present in order to contain the suspension packaging beneath. The nose itself is heavily sculpted to improve flow around it and drive other key performance parts such as the turning vanes which are connected to it. The bargeboards seen in these images are clearly placeholders as they lack the length, let alone detail we’d expect to see this year. Returning to the sidepods we can see that the surfaces surrounding the inlet have been carefully crafted to manage flow performance, whilst the single outboard deflector is likely just a placeholder at this stage, with more complexity likely to be added in the upcoming pre-season test. The mirrors have two supports, both of which will be placed in more aerodynamically advantageous positions although the regs surrounding this behaviour have been curtailed for 2019. The large airbox carries over from last season and follows a trend from their powerunit manufacturer that see’s them place many of their oil coolers in a saddle position above the engine. As we can see from this side view, the sidepods are extremely svelt, tucked in as much as is possible in order that they hug the various coolers and ancillaries within, without damaging the cars aerodynamic output. The cooling outlet has also been raised at the sidepods tail in order that they can get the maximum amount of flow through the coke bottle region beneath. At the rear of the car the rear wing support pylon is much straighter than last year and at this stage doesn’t have a T-Wing attached to it or the engine cover in front, but I suspect we’ll see one in due course. The now enlarged rear wing features a spoon-shaped mainplane and is devoid of the endplate louvres we’re used to seeing due to the change in regulations. Meanwhile, like Haas before them they’ve cut out a straked section into the endplate in the transition region. Toro Rosso have a solid contender, one that should allow them to at least battle on occasion with the front running midfield cars. I suspect that there's still a fair amount to come from the team in coming weeks, with several more detailed areas of the car clearly not finished in these images. I would also suggest that they may be slightly on the backfoot at the moment too though, as the loss of James Key to McLaren at the backend of last season will clearly have an impact on their working processes and development cycle.